Over the last few weeks I have been working to get all my books into a place where free sample downloads are available in a variety of formats. So for downloads of all different kinds you can check out the downloads area of the Kephrath site, or Goodreads, or Leanpub, or Kobo books – everything on Kobo is at 50% off until Jan 31st, so long as you use the discount code JAN1650, which in my case includes In a Milk and Honeyed Land and The Flame Before Us – or Google Play, or the iBook store. To read online check out my Issuu listings – also there are links to the individual publications from several of the pages on this blog or the Kephrath web site. All in all, I have put out sample material in a lot of different places and formats! 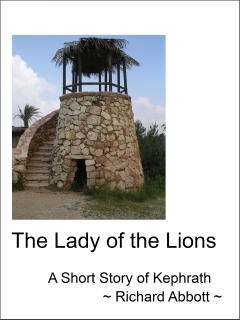 Along with that, I have widened the distribution of The Flame Before Us to include several ebook stores as well as just Amazon, and for simplicity am in the process of making the Kindle and ePub price of all of my historical fiction books the same. That is not quite finished yet, but will be before too long. 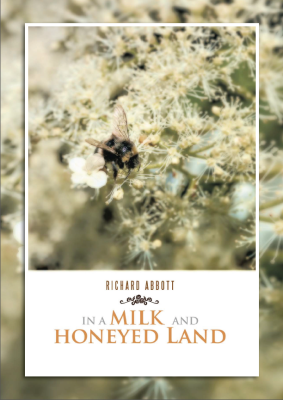 Finally, I have released In a Milk and Honeyed Land under the Matteh Publications banner now, so after a suitable pause you can expect to see the listings change slightly at various online bookshops. Oh yes, there’s also a short radio advert going out for Far from the Spaceports on the Christian radio station KATZ – here’s a link to the ad, at offset 33 minutes and 46 seconds. Exciting times for a new year! 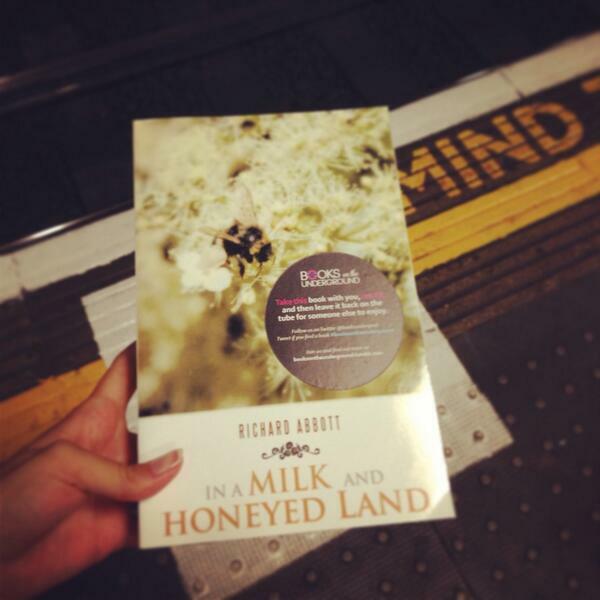 Those of you who regularly travel on the London Underground (as of course I do myself) could have a look out for two copies of In a Milk and Honeyed Land which are now part of the “Books on the Underground” scheme. Check out booksontheunderground.tumblr.com for more details, or follow @BooksUndergrnd on Twitter. In a Milk and Honeyed Land began its subterranean wanderings at Victoria this morning… hopefully I might get to hear of other sightings in time! 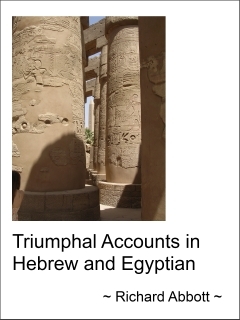 At long last I have been able to complete preparation of the epub version of my PhD thesis ‘Triumphal Accounts in Hebrew and Egyptian’. The kindle version has been available for some while now on Amazon UK and Amazon.com, but this opens up more distribution opportunities. So right now it is available at LeanPub – https://leanpub.com/triumphalaccounts – and it is queued up for approval at Google Books and iTunes. As usual, it will take a few days for it to appear at these places, and anywhere else I can find. 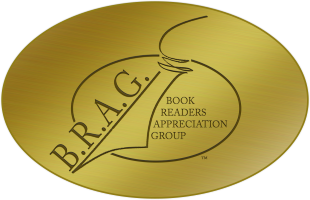 Another excitement of the week is the start of a group of readers/writers/reviewers who intend working through a book at a time. Some explanation is at http://www.kephrath.com/BookReviewGroup.aspx, and I wil fill in more details as they come along. The first book is Marian Allen’s fantasy novel The Fall of Onagros, and our target is to read it, review it and interview Marian during August. Should be fun. More updates – and the birthday giveaway has not yet ended! Flowing, eloquent descriptions of the region, traditions, music, and writings of the people of those times immerse the reader. I felt as if I were there, standing at “the high place” with the world spread out before me, walking in an ancient olive grove, hearing the soothing notes of a lyre. I wanted to be there, to be part of the exhilarating festivals, to share in the people’s sorrows, to face their challenges with them. I couldn’t turn the pages fast enough, yet I hated to see the book end. 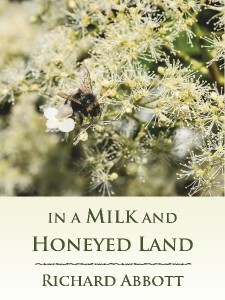 Considering the depths of emotion explored, the lessons conveyed, and the story told, “In a Milk and Honeyed Land” is an astonishingly easy read. More than that, it’s utterly beautiful. The birthday giveaway continues – some of the free download tokens have gone but others still remain, so if you want to receive a download token and instructions how to use it please contact me at books@kephrath.com soonish. Electronic copies only, I’m afraid, as the physical soft- or hard-back versions are not included in this. So meanwhile… updates continue over at the Kephrath site. Some of them are just geeky things to bring the web technologies used up to date – the shiny new rotating news feed on the home page is one such, and the book review filter at http://www.kephrath.com/BookReviews.aspx is another. But as well as that I finally got the timeline page out at http://www.kephrath.com/Timeline.aspx. It’s fairly basic at the moment but from this point on I can enhance it as time permits. In a Milk and Honeyed Land is a year old shortly! The exact date depends a little whether you mean the physical or electronic version, and I’m not fussy about the details, so May 31st is as good a date as any. Many thanks to all those who have read the book this last year, especially if you have given some feedback. Over the last year I have had contact with a lot of great people and new friends, and feel enriched because of it. To celebrate the event, I have organised a giveaway with the publishers Trafford. I have a limited number of tokens which will allow people to download an electronic version (epub or kindle) from the Trafford site. If you are interested, please contact me with your email address and I can supply details of how to download. Numbers are limited, so please don’t delay too long. This could be a great opportunity to get a copy for a friend. It applies to the electronic version only, not physical copies. Other news – I have written a couple of book reviews. The first is for Of Battles Past, by Bryn Hammond. As usual, a quick summary may be found on the Kephrath web site (see http://www.kephrath.com/BookReviews.aspx), and the full review is at Amazon, Goodreads and Shelfari. As for the second, it is my great pleasure to be contributing again to Erin Eymard’s Bookworm’s Fancy blog (http://bookwormsfancy.wordpress.com/), with a review of A Swarming of Bees by Teresa Tomlinson. I loved this book, as you can read shortly. This review will appear on Erin’s blog in a few days time so keep a look out. Also, The Man in the Cistern is now available on the iTunes book site at https://itunes.apple.com/us/book/the-man-in-the-cistern/id648034238?ls=1 (US), https://itunes.apple.com/gb/book/the-man-in-the-cistern/id648034238?ls=1 (UK), or other regional iTunes stores. Price varies a little per region but should be around the £1 / $1 etc mark. Finally, I have been overhauling the Kephrath web site a little to take advantage of some new web technologies. There are no really dramatic changes but I have changed the way some of the navigation works. 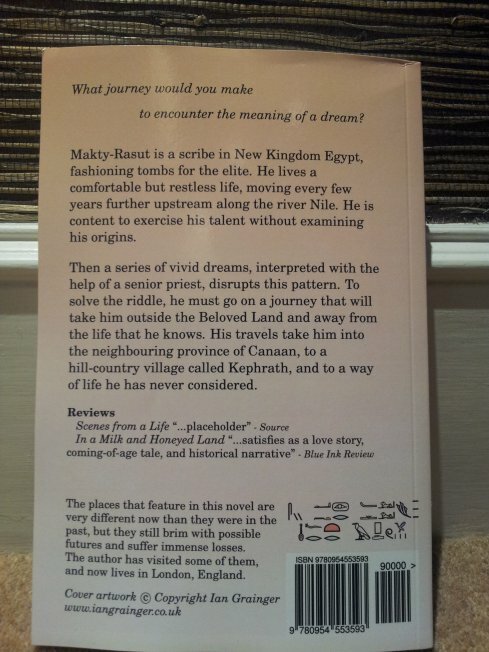 and the way my book reviews are displayed on the page http://www.kephrath.com/BookReviews.aspx. Currently there are a few problems with old web browsers such as Internet Explorer 7, but any modern browser should be fine. I hope to iron out the last issues shortly. Enjoy! I thought this week I would post up some images taken over the weekend from in and around home, which have some sort of loose connection with the world of Kephrath. 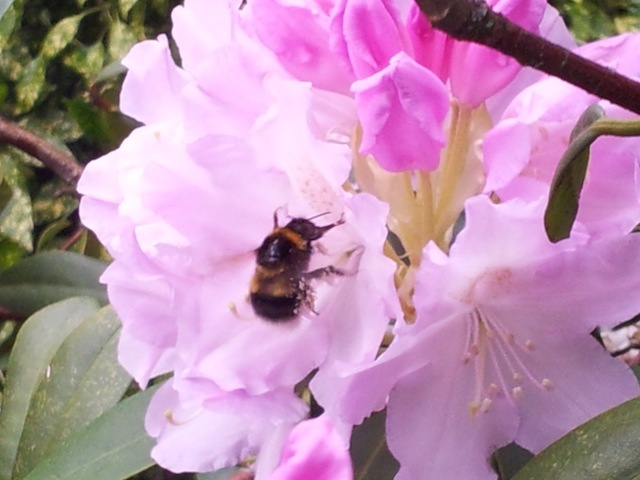 The first is a bee-and-flower picture – nowhere near as sharp as the real book cover, but this one was just at the back of the garden with our own bee! 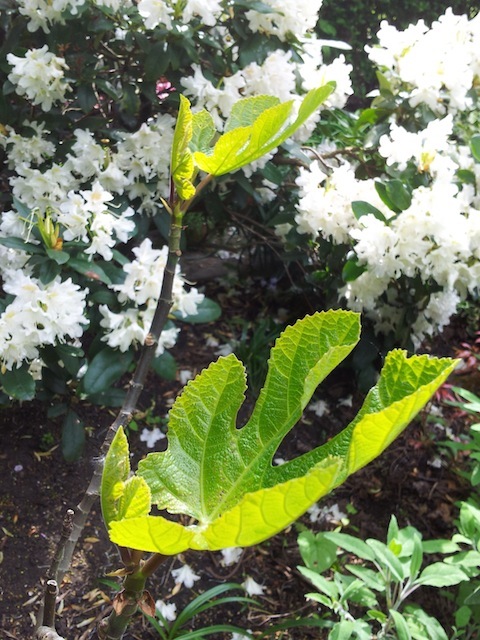 The second is our fig tree, which is now (after a slow cold start) coming into leaf. Back in Southampton our fig tree there produced some fruit each year, the amount varying considerably with the season. This little one is only last year’s planting and so is some way away from fruiting yet… but great to see the leaves emerging. Qetirah poured them each a little red wine from a stoppered jar. They drank it very solemnly, eyes fixed on one another. She took one of the figs and pulled it in two, giving half to Damariel. He held the fruit in his hand briefly, caught by the dark flesh speckled with seeds. When they had finished he took another fig and did the same, this time keeping hold of it for her to eat, feeling her lips against his fingers. Finally here is a view of a corner nearby. 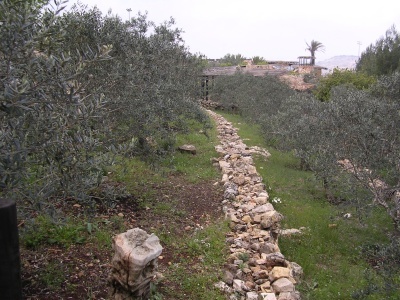 The connection here is quite tenuous but made through the name Gilgal – the name of the first encampment of the Israelites across the Jordan. The camp itself was roughly square, insofar as the arc of the River and a few encroaching outcrops of rock allowed, and was divided into unequal regions of tents by interior paths. Nepheret supposed that, like islands in the inundation that she remembered from childhood, the tent groups were occupied by different families. The people she could see wore a range of brightly coloured kefs, and for a moment she was reminded of the flower fields that filled the hill country in the spring time. Feeling truly geeky, I also started preparing the epub files for uploading to other ebook vendor sites once the Amazon KDP Select exclusive period is over. This turned out to be more of a trial than I had expected. First go – just use the auto-convert feature in the excellent Calibre program. But that turned out to mess up all of the contents links. So I turned to the internet, and the first web page I looked at was breezily confident. Seemingly, all you had to do was put files in the right folders, use the same metadata specification file as you had with kindle, add a couple of extra config files, and compress the result. Well, the steps were easy, but the result omitted the cover art and had a number of other annoyances. Eventually I solved the problem with the help of a handy tool called Sigil which did a nice job of disentangling the various bits and pieces. A few tests on various epub apps were (broadly) successful so now I have the basic principles OK. When epub distribution time comes I feel in a much better place now than I did last night. A new review – and a giveaway this weekend! for free Kindle copies downloaded December 14th-16th! Please check that the item is free in your specific time zone at the time of download. 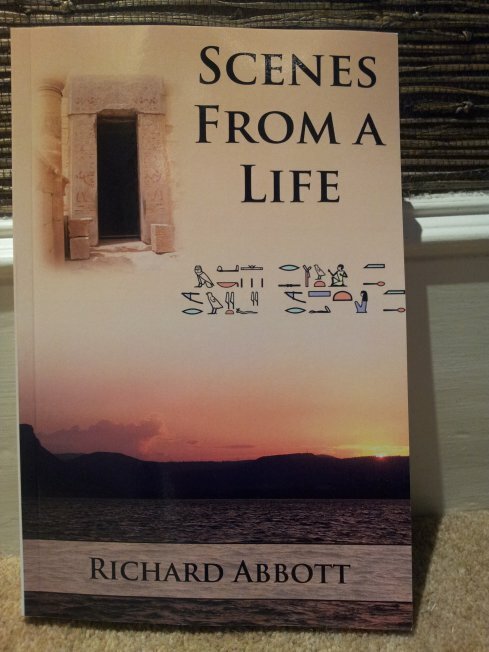 This gives you time to read it and then buy the full length novel In a Milk and Honeyed Land for Christmas in Kindle, Nook or physical formats – see http://www.kephrath.com/WhereToBuy.aspx for buying options. This is time travel at its best… The period is thoroughly researched and the voice authentic. stories are told in a different way – slowly, carefully, step by step rather like the long journeys of Damariel… We read about unfamilar religious customs and values but can detect traces, beginnings of the world we know. 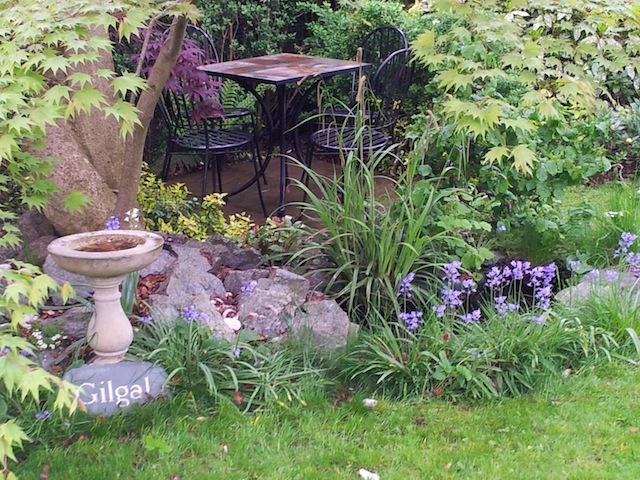 We see also the more recognisable human dilemmas and responses to those changes… There is space and time to reflect. The atmosphere of that is captured….for those who can leave their twitters and instant lives to one side, and be patient..